Dendera Casino is a well established online casino with a solid reputation and client base stemming from its ability to remain consistent and progressively innovative in providing players with the best in online gaming for over 5 years. Dendera Casino is well known for its advanced security features, transparency and game fairness with payout percentages which are amongst some of the best in the industry. Dendera casino is a bonus friendly online gambling site which strives to reward players for any type of game they like to play or the bonus type. 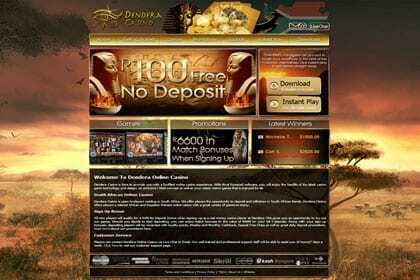 Dendera online casino use Rival powered software and accepts South African and American players. The casino software is in English, French, German, Italian, Spanish and Dutch. There are 4 currencies: USD, Euros, British Pounds, Australian Dollar and South African Rand. Please visit your cashier to claim the R100 No Deposit Bonus once you have registered an account. Only one sign up bonus per household, computer or IP is allowed. This bonus is only available to ZAR accounts. The maximum bonus amount is R100. Players will have to wager the bonus 50 times before a withdrawal can be made. The Rival software is available both in flash and download format and supports multiple languages such as Spanish, French, German, English, Dutch and Italian. The casino lobby is attractive and appealing, easy to navigate, classy with a toned down colour scheme that is easy on the eye. The mobile casino section (Coming Soon) is an innovative approach by Dendera Casino to cater for players that like to play on the go and to enable the casino to remain competitive in a rapidly evolving online gaming industry. Dendera has all the casino games a player would expect including single and multi-hand blackjack, jacks or better video poker, American and European roulette, Keno, Vegas Jackpot Keno, 3 Scratch Card games and the Sudoku slot. Some of the classic 3 reel slots include Gold Rush, Big Cash Win and Sevens and Bars. The video slots include some of the best games ever played. The iSlots range of slots is unique as a story unfolds while you play the game. The progressive jackpot network is relatively small in comparison to other casino software providers with the jackpot totals averaging around $150,000 in total progressive jackpots. Dendera Casino believes in looking after their players and to achieve this they offer a welcome deposit bonus and additional deposit bonuses such as 5000% and 4444% Match bonuses. There are regular daily, weekly and monthly promotions including the Sunday bonus and comp points awarded to loyal players. Dendera Casino is licensed and registered under the laws of Curacao. The customer support team at Dendera Casino is available to assist 24/7 on a range of issues such as the deposit process, bonus and wagering requirements. For a well-rounded online casino with a great selection of games, bonus offers, a committed customer support team and reasonable payout percentages, please join Dendera Casino and experience the best in online gaming. Dendera Casino has all sorts of exciting bonuses. If you’ve yet to register, today’s your lucky day! To start playing now, or to find out more about the site and software, visit www.denderacasino.com or contact their friendly international customer service team, 24 hours a day, 7 days a week. Visa, MasterCard, Maestro, Diners club, Visa Electron, Delta, Ukash, Entropay, Neteller, Click2pay, Skrill, Eco, Ideal, Sofort, Poli, GiroPay and more. Loyalty Program: Weekly Loyalty Bonuses, Earn loyalty points and redeem them for cash, Weekly and Monthly Cashback, Free Chips every week.